Irish bandana features green and white shamrocks on a Kelly green design. Sorry, the forest green shamrock bandanas that are pictured in the image are now sold out. 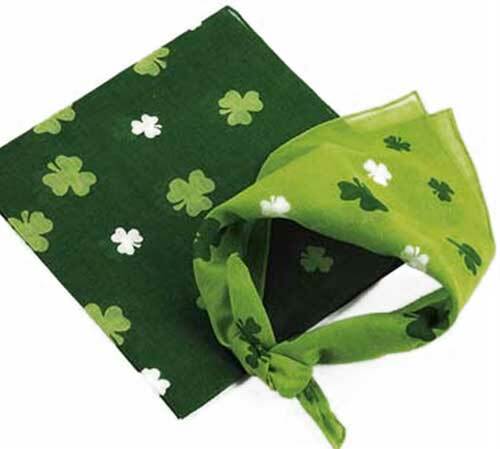 This green Irish bandanas are enhanced with shamrocks and are available in Kelly green. The 100% cotton shamrock bandana measures 20" x 20" and would be fine to carry on St. Patrick's Day or on any day that you wanted the luck of the Irish. The Irish bandanas are received with a shamrock history card, complements of The Irish Gift House. Irish bandana is a Kelly green design that features white shamrocks in a variety of sizes. Irish bandana features the words Kiss Me I'm Irish and is enhanced with shamrocks. Irish bandana features a variety of shamrocks and clovers.